Microchipped Bees Will Show Us Where They Buzz Off To! Australian Scientists are planning to place tiny microchips on the backs of 5,000 honey bees soon in an effort to learn where the little stingers go in an effort to combat colony collapse disorder. Do you think the scientists on the low end of the totem pole have to stick the chips on the stinging bugs? 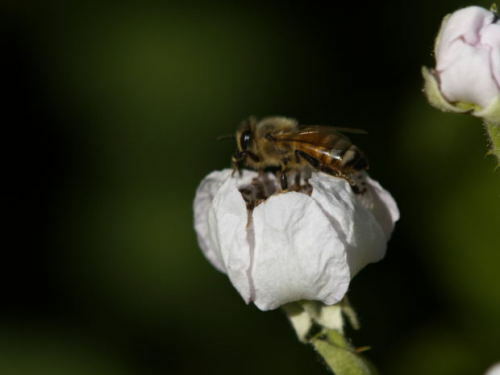 Researchers are hoping to learn more about the parasitic varroa mites, pesticides and colony collapse disorder phenomena that have plagued the southern hemisphere’s honey bee population. The team is hoping that tracking thousands of individual bees as they buzz all over the island of Tasmania will give them a better understanding of the insect’s relationship with the environment. After individual bees have been lured to sleep with a mild dose of refrigeration, a 1/16th of an inch sized radio frequency sensor will be glued onto their backs. To ensure that the little devices stay attached, some of the bushier bees will need to be shaved down first! Following bees with these sensors is only the beginning, as the researchers are developing ways to shrink the gizmos down to snugly fit insects as small as mosquitoes. I can’t help but to wonder how they learned the safest bee shaving procedure, and how a bug as tiny as a mosquito would be able to fly with a sensor glued to its back, but I’ll leave that up to the Commonwealth Scientific and Industrial Research Organization to figure out. Here’s hoping that we’ll get some insightful information that can be applied to the globe’s disappearing bee problem sooner than later! Ever Wonder How Animals Eat Their Food? The Insanely Funny Animal Video of the Day!!! Rex The Dog Marionette -- The "Practice Makes Perfect" Animal Video Of The Day!! !